I wanted to share the story with you because the details of their life and survival are astounding – you can find the article here. And the image of the old man’s clothing grabbed me – I guess you could call it extreme mending. Mending is fascinating and I think so often beautiful. My policy on possessions is have good things you love, not too many, and keep them for a long time. I almost never buy clothes. 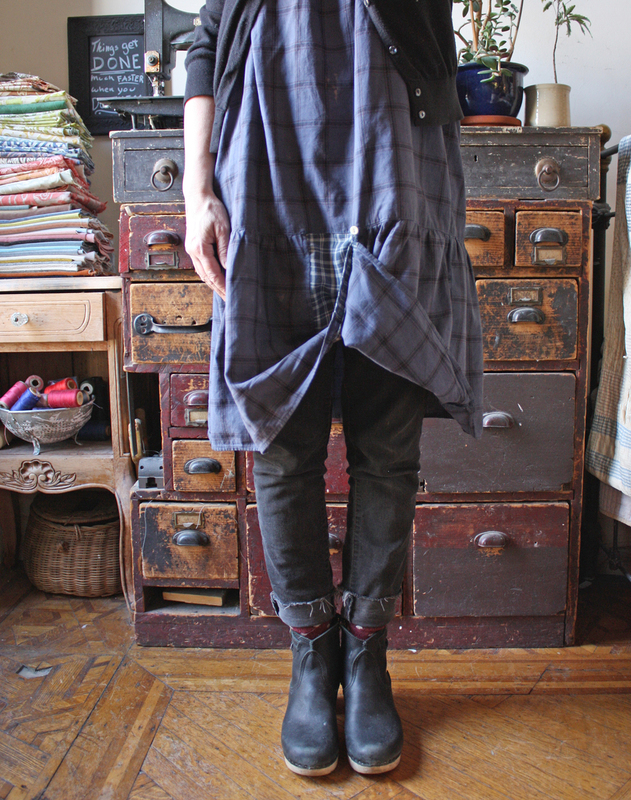 There are a just a couple exceptions – every once in a while I buy a smock dress from Cal Patch and wear it relentlessly. First there was this one and then last summer this one. It’s my uniform – I like having a uniform. Most of what I have was given to me and much of it I’ve had for a long time. I mend things, make do, re-use and repurpose. I like the practicality – economy and the aesthetics. The blue jacket was given to me 15 years ago I think – I wore the sleeve edges ragged and I’m patching them with lovely old cloth from Sri Threads. The green jacket above I’ve had for about 20 years – it has lot’s of issues but not enough to let it go – I’m patching it with gorgeous Fortuny scraps. I’m partial to flannel shirts and the red plaid above is a favorite – besides the ragged sleeves (I’m hard on sleeves) It had a big hole under one arm. Nothing says success like an underarm hole. I patched it with a 19th century dress maker’s scrap. 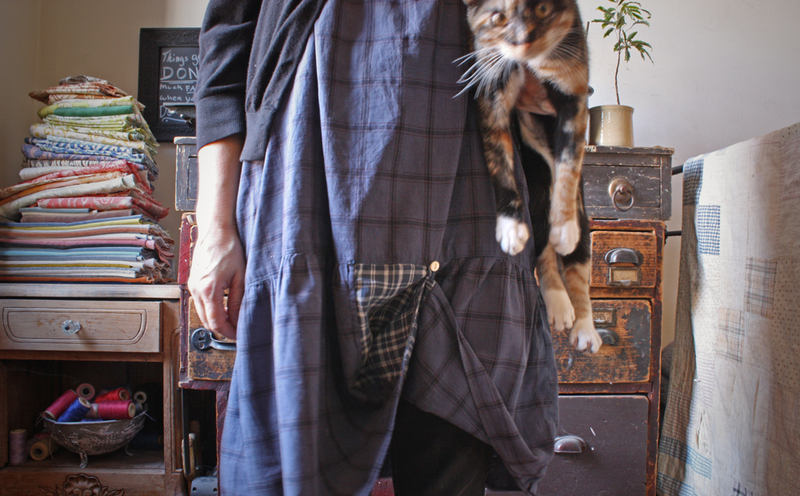 And the dress above – also a hand me down – is one of my most adventurous mends. The bottom of the skirt had a big section with glue or something spilled on it. I cut it out and sewed in a section from a cotton camisole. There was a little button loop and I left it at the bottom and added a button to the seam so I could pull the hem up. Pretty fancy. And Moose – there has to be a photo of Moose and she sort of agreed to participate. She visited here all week – such a good kitten. 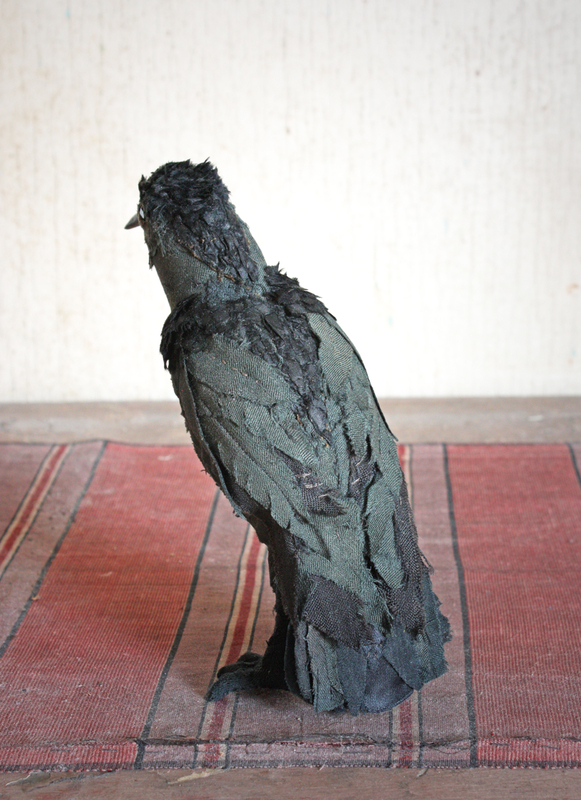 In other sewing news – I finished the victorian bird! 9 years after starting – but still – so good to get it done. The story of the Siberian family is incredible. I may have to get the book to learn more. Thanks for sharing that! What an amazing story! I’m so glad you shared it with us. Loved the story, thank you! 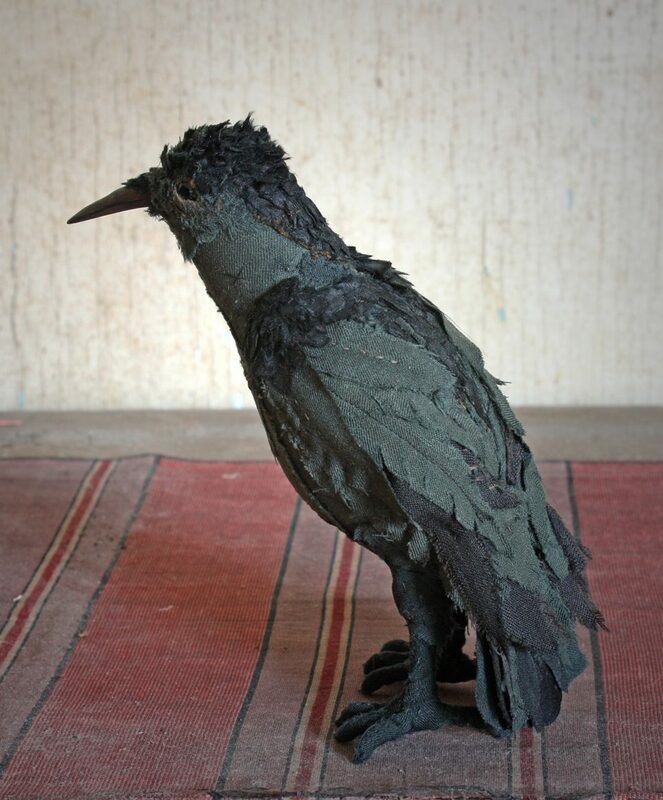 And holy smokes, the Victorian bird is lovely – so lifelike. On my fridge I have a magnet that says “Make Do and Mend,” which I think just about says it all. Mending is an invaluable skill in my book, and so meditative. I love mending! But, I don’t do it beautifully. I do aim higher though. I look forward to taking the time later today to read the article on that family. Oh my. Thanks for sharing the story about the Siberian family. I vaguely remember reading something about them years & years ago…now, I have to go read all about them. Hi Ann! I love your “extreme” mending – it makes my heart happy. I, too, love to do that…currently working on a cotton hoodie that’s been my “comfort” around the house, sweatshirt for well over 20 years. Hubs calls it my “wubby”. I just can’t live without it. I remember reading about the Siberian family. Amazing that WWII simply passed them by. Your much mended clothing has such a coziness to it; like wearing an old friend. And, I couldn’t help but think of E.A.Poe with your Victorian bird; one of my favorite poets. 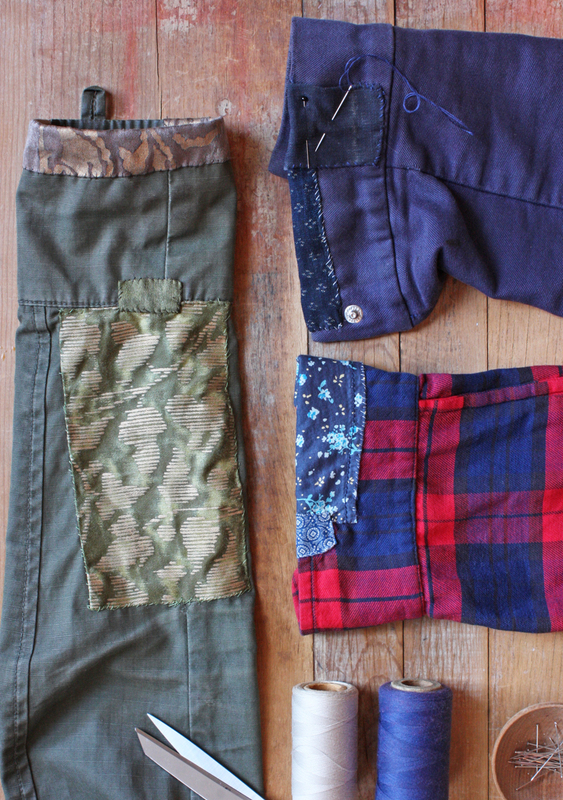 Your mending creates new clothing. I really like the blue dress and the way you pulled up part of the hem. How fun! Funny thing about “Lost in the Tiaga.” Years ago a man asked me if that family was related to me, due to the religion I was raised in. (I’m not related.) My family are Germans from Russia. I’ve always meant to read the book and now I am reminded of it again. Thanks for sharing. I always enjoy receiving your emails. Thanks so much Jan – Moose is my friends kitten – she visited while she was on vacation last week – lovely kitty. Love the extreme mending too! The bird is wonderful, what is it’s name. Interesting story. Thanks for sharing. Tell me about the boots……fascinating site. So glad I found you. Hi Ann! Thanks for sharing the story of the Siberian family – amazing. I remember something about it from a long time ago, it was good to read all about them. 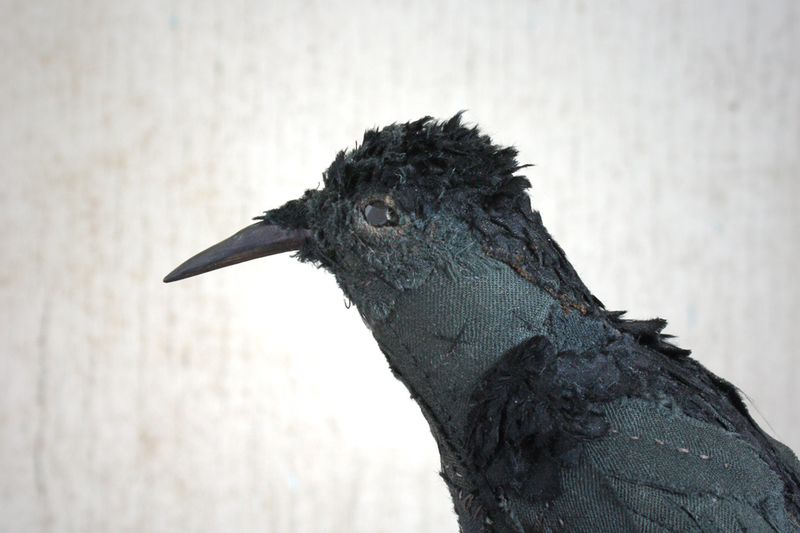 And I love the mending and Victorian bird too, he is gorgeous. I also enjoyed the link to Clare Youngs – I have one of her sewing books, but I didn’t realise she also worked with paper. Seeing her lovely paper things made me think you might like to see Jennifer Collier’s work. She has a studio here in the UK not far from where I live, and makes the most incredible things with paper.